Advisers on board the Conservative campaign tour are frustrated their leader is effectively being accused of heartlessness after refusing to extend further Canadian generosity and refuge to the families fleeing brutal violence in Syria and Iraq. Advisers on board the Conservative campaign are frustrated their leader is effectively being accused of heartlessness after refusing to extend further Canadian generosity and refuge to the families fleeing brutal violence in Syria and Iraq. The assessment on the tour is that the heart-rending picture of Alan Kurdi, the Syrian toddler found washed up on a Turkish beach, should be motivating Canadians toward the Conservative point of view — and not away from it. In Whitehorse on Friday, Conservative Leader Stephen Harper's ire clearly rose as he responded to a question on the topic. His voice became thin and strained as he spoke about how he viewed the reality on the ground in the Middle East — and how badly wrong he felt his opponents had got it. Just a few hours earlier, NDP Leader Tom Mulcair said in his view there was no legitimate role for the Canadian Forces in Syria. The party also reiterated its call to increase the number of refugees Canada would accept. "The premise of the question once again is that somehow there is a choice between refugee and humanitarian aid and providing military assistance to those countries, " he said. "That is not a choice. We have to do all of these things." Harper said making changes to refugee policy will only tackle a tiny part of the problem, and will do nothing to staunch the flow of refugees out of Syria. That can only happen, he added, by going after what's causing people to flee in the first place — the terrible and inhumane excesses of the Islamic State. The NDP, Harper insisted, has been motivated by anguish over the image of the drowned Syrian boy, but has failed to consider those victims of ISIS who are tortured and brutally murdered, cast off buildings, drowned in cages or blown up. 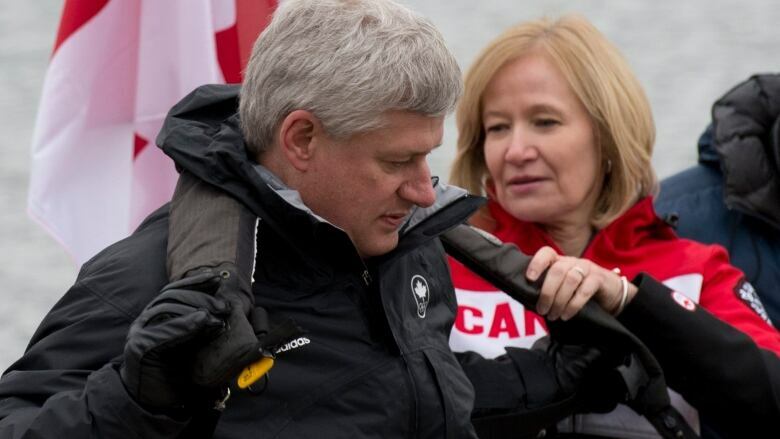 "We see this terrible picture of Alan on the beach dead," Harper said. "We have pictures every day, videos, of people being tortured, massacred and driven out of their homes and rendered homeless and without food and shelter. Every single day. "And to suggest that the Canadian military in concert with our allies, would do absolutely nothing? Forget about how wrong that is from a humanitarian compassionate sense. We would allow our own security to be threatened in that way, a group like that to set itself up as an empire in the middle of the world to launch terrorist attacks against us?" Kory Teneycke, a key Harper communications adviser, told CBC News on Friday the Conservatives had been treated unfairly by both the opposition and the media. In his view, news coverage of a Conservative campaign promise to increase by 10,000 the number of refugees accepted from Syria was slight. He also suggested the plight of Syrian refugees had been largely ignored by the opposition until the death of Alan Kurdi shocked the Canadian conscience. "We were working on this and doing this before they had any interest in it, and frankly, before the media had any interest it," Teneycke said. It is true the issue did not arise as an important campaign question until the photos of Alan Kurdi's lifeless body found their way onto the internet. But the story's resonance was amplified considerably by Canadian news reports that said the boy and his family had been trying to get to Canada, had formally applied and been refused. That false allegation, barely retracted in the Conservative view, painted Harper and his team as heartless, when in fact the government had already announced improvements to its policy and been ignored. "Our concern on the issue predates the photo," Teneycke said, and it predates the NDP and Liberal concern for the issue. "Welcome to the issue. We have been here all along." "Just because they're playing politics with this issue, doesn't mean that we have to. And we're not going to." The Conservatives have already written the issue into Harper's stump speech as an attack against the Liberals and NDP. "If we were not there, the advance of ISIS would not have stopped," Teneycke said. "It would have continued to roll over millions of more people and we would have millions and millions more refugees and displaced persons and victims and dead and all of that." James Cudmore covered politics and military affairs for CBC News until Jan. 8, 2016.